Nintendo hasn’t given away too many details about their upcoming console known as NX. Rumors abound, with speculation based on patent filings, and recently a few leaks about the NX controller turned out to be hoaxes. 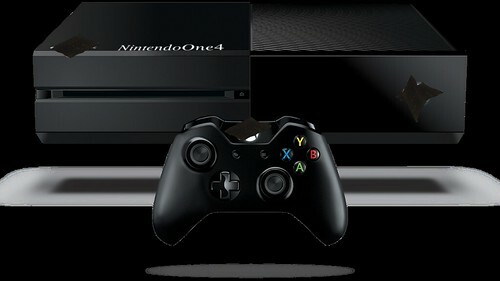 It is with great excitement that we introduce to you the NintendOne4, our most advanced home entertainment console yet! In the past our systems have been designed around the kinds of games our designers would like to create, and we usually kept those systems a secret until we felt we accomplished what we wanted it to do. Sometimes, however, what we create isn’t always well received by our customers. They were clearly referring to the disappointing reception of the Wii U, of which they recently denied rumors that they had stopped production on it. Many of their target customers were never clear on what the Wii U was and why they should have bought one. The NintendOne4 surprised many analysts who expected yet another console that was more unique than what competitors were offering. Instead, Nintendo has opted to put out a system that seems more inline with what a follow-up to an Xbox One or PS4 would look like. We’ve designed this new system based on the enthusiastic feedback of our most passionate fans, and we think you’ll love the gaming experiences this new system allows for. Nintendo of America’s Reggie Fils-Aimé was quoted as saying, “We’ve always been interested in what the fans want”, and that the company was moving in a completely different direction due to the needs and wants of a devoted following. When pressed about this group of fans and their influence, Fils-Aimé referred vaguely to a very small group involved in social media who coalesce around “some hashtag or another.” They’re Nintendo’s essentially free focus group, and they have been instrumental in the company making the strategic moves they did. He quickly changed the subject to speak excitedly about the NintendOne4’s launch titles. Almost 300 games are available, and some surprising items in the list include Halo 5: Guardians, which was originally a Microsoft-exclusive title. “Yes, we have some very interesting partnerships,” said Fils-Aimé, while gesturing with wagging fingers in the air.